A Botanical Garden in Tsumeb? Way back in time when the land didn’t belong to anyone and before roads criss-crossed the country, groups of hunter-gatherers travelled between the mountain enclaves, attracted by pools of water and game. They wouldn’t have been jiving to rock ‘n roll tunes, but would rather have used their rocky surroundings in an entirely different and innovative manner. The smooth sandstone sheets and rock shelters were their canvases for communication with the gods and fellow groups, and their lofty homes were cathedrals of prayer. 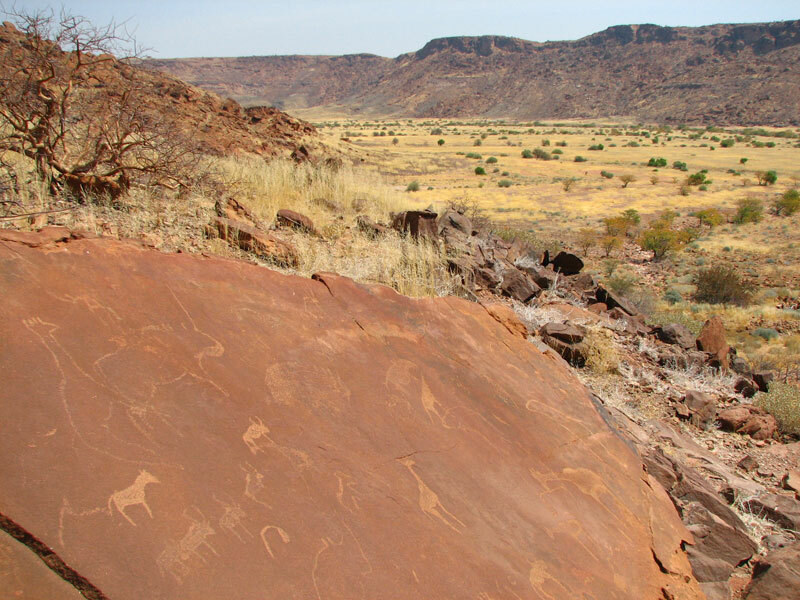 Namibia’s dry climate has preserved this prehistoric rock art at places like Twyfelfontein and Brandberg, giving us clues to a way of life and a time that has long since disappeared. The small spring in the Twyfelfontein Valley – whose yield in modern times would be doubted by farmer David Levin, leading him to call his farm Twyfelfontein (Doubtful Spring) – provided water for hunter-gatherer groups in the drier months of the year. 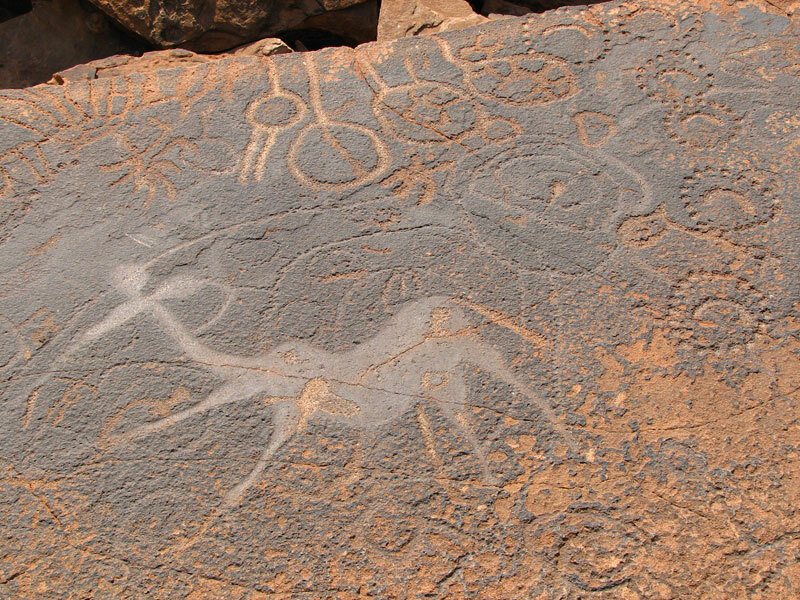 Although some of the engravings appear to be representational in nature – the repetitive depiction of power animals such as giraffe for rain, ostrich for food, zebra to bring luck for the hunt, and rhino possibly for protection – and the merging of animal and human figures, reveal to us that they were most probably chiselled into the flat panels of sandstone by the shaman or medicine man as he asked the gods for rain, shelter and food. Giraffes with long legs and tapering necks reach heavenwards, their heads portrayed as hands with four fingers pointing upwards, while engravings featuring a dancing kudu with a human torso and a lion with a handprint at the tip of its tail reveal the merging of the spiritual and physical worlds. The act of engraving itself could possibly have been a way of entering trance or focussing energy, the locations of the engravings being doorways to the spirit world or points of power. Two to six thousand years before Elvis would be rocking around the clock, the shaman was tapping out a different tune, beseeching the gods for daily sustenance. 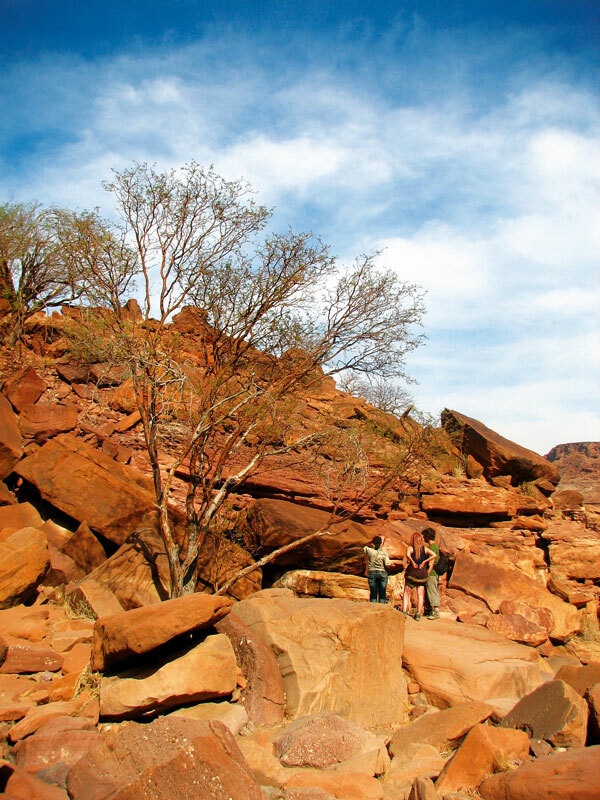 The Brandberg rock paintings are relatively newer, painted in overhangs by later hunter-gatherer groups approximately two thousand years ago. Unlike the engravings, they depict people rather than animals and are generally thought to be more informative or communicative in nature. Hunter-gatherers assembled amongst the small waterholes in the mountain, living on plant food and small game, painting figures using earth pigments mixed with egg albumen or animal blood, daubed onto rock with animal hair. 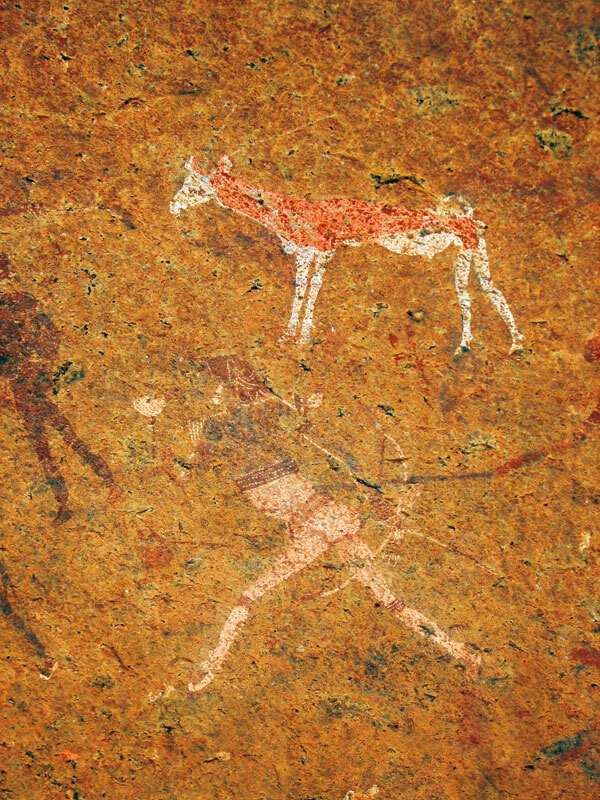 The earliest rock art in Namibia, however, was discovered at the propitious time of the first moon landing in 1969 in a cave in the Huns Mountains in southern Namibia. Archaeologist Wolfgang Erich Wendt listened to a radio broadcast of the event while excavating the cave, calling the site Apollo 11. Seven slabs with paintings depicting animals were found in the Apollo 11 Cave. The charcoal pigment from the surrounding sediment was radio-carbon dated as being between 26 000 and 28 000 years old, making the paintings some of the earliest known artistic representations of humankind. 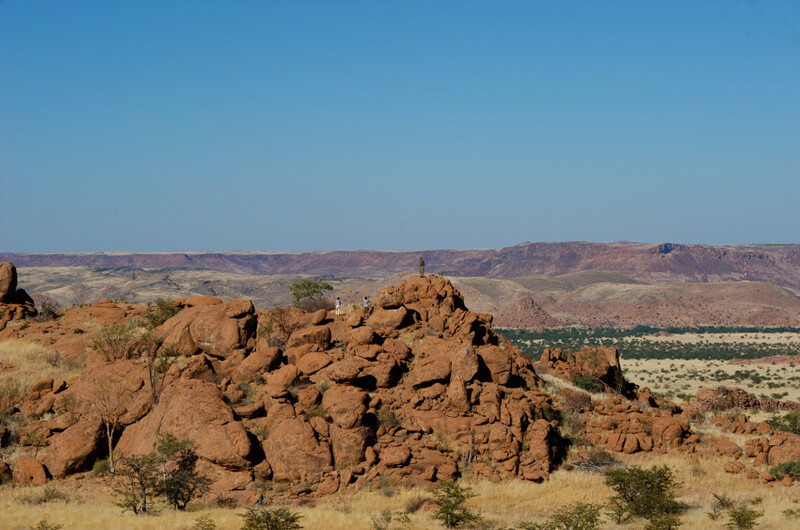 The Apollo treasure is safely stored in museum vaults, but every year thousands of visitors pay tribute to our past at Twyfelfontein and Brandberg. 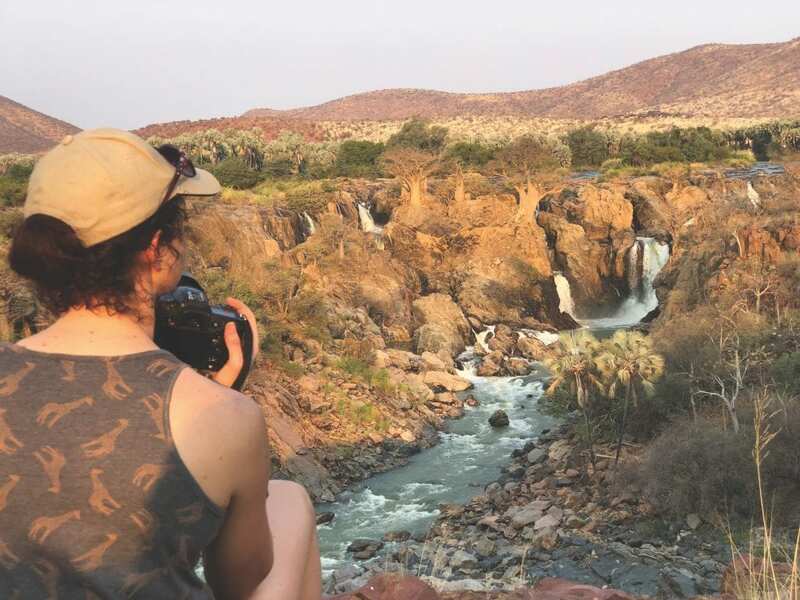 A visit to Namibia wouldn’t be quite the same without some time allotted to rock ‘n roll among these ancient open-air art galleries. 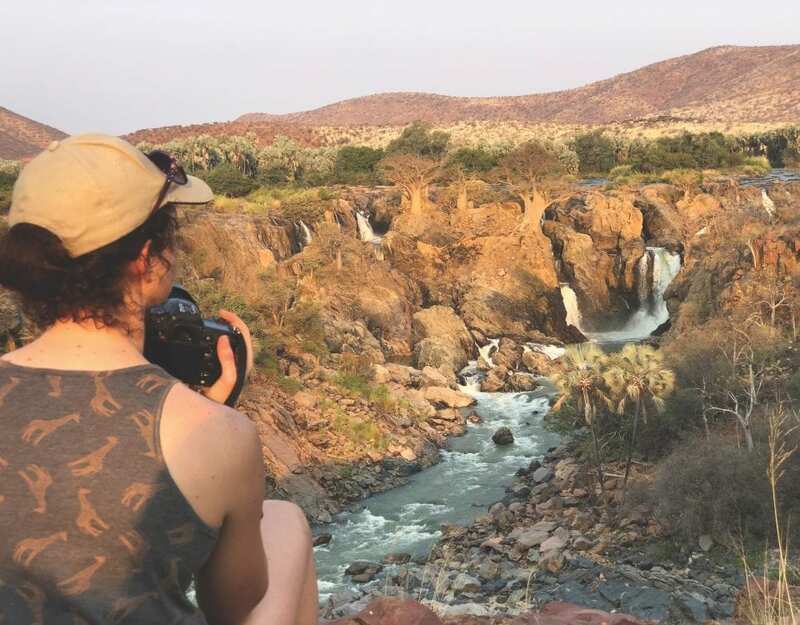 North-western Namibia is the place. 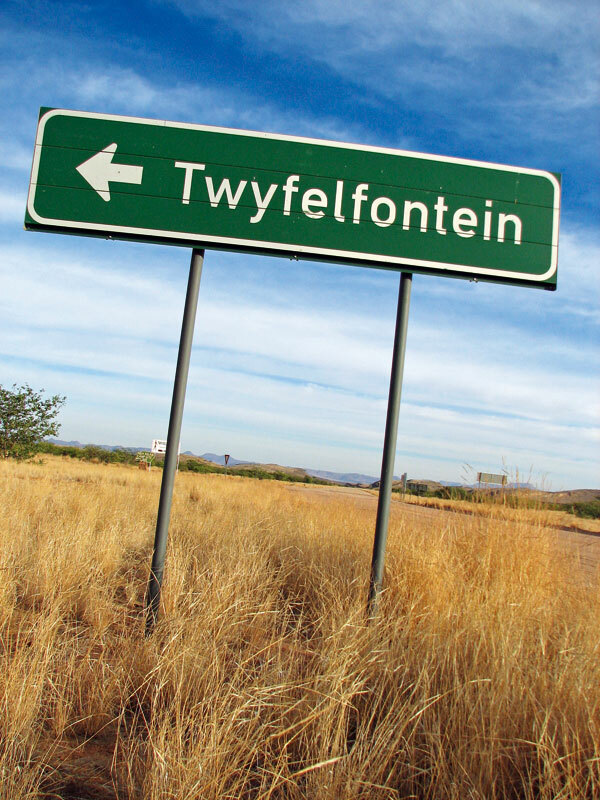 The turn-off to Twyfelfontein is 60–70 km west of Khorixas on the C39 and can also be reached from the D2612 if travelling from Uis/Brandberg. Two guided walks can be undertaken. The Brandberg is approximately 40 km north-west of Uis. Set at least two hours aside for the guided walks offered by the Dâureb mountain guides. Twyfelfontein or /Uis-//aes (place among packed stones) was recognised for its cultural value, gaining world heritage status in 2007. The rich store of more than 2 000 rock engravings or petroglyphs provides a valuable record of this period in humankind and an important link to our hunter-gatherer ancestors. Namibia’s dry climate and the world-heritage status of the site ensure protection for this important link with the past. These are the so-called lion-man, and the dancing kudu. The lower areas of Twyfelfontein hold the older, more symbolic rock engravings, consisting of lines, holes and circles, while animal engravings start appearing higher up. 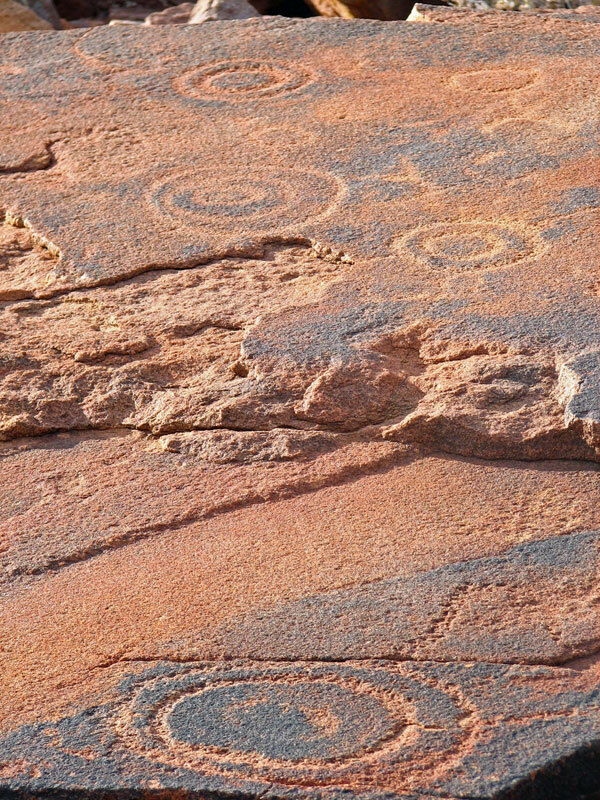 At one place on the valley floor there are circles within circles engraved in the red rock. These 4 000-year-old engravings look remarkably like a representation of the solar system. The Mount Etjo sandstone of the Huab Valley was fractured along natural fissures, revealing flat surfaces that were ideal canvases for future rock artists. The softer porous aeolian (wind-laid) rock could easily be engraved by a harder rock, with the similar size of the sand grains allowing a clear image to be created without other particles breaking up around it. Desert varnish, the red sheen that covered the image over time, is a thin half-to-three-millimetre layer resulting from the oxidation of the iron found in the sand. The engraving would have initially appeared whitish grey on a striking red background, ensuring clear visibility, but darkening over time. The desert varnish – the advance of oxidation – allows us to determine the age of the engravings. The progression of oxidation is no fast process, however, and has taken 5 000 years to complete. The well-visited Twyfelfontein engravings provide a history book, guidebook, map and bible all in one, or a museum, art gallery and cathedral… or possibly more than that. Perhaps our spiritual lives are so vastly different from those of men who could easily perceive the human form transforming into a spirit animal or vice versa that our understanding is limited. Perhaps our lives are now so unlike those of the hunter-gatherers of prehistory who lived harmoniously and interdependently on the land that we cannot relate to their visualisation. Surviving rain, weathering and time, the White Lady rock painting is the highlight of a Brandberg visit. The White Lady, the name coined by Abbé Henri Breuil in 1955, is now understood to represent a healer or medicine man holding a bow and arrow in one hand and a cup or wand in the other. It can be viewed in the Maack Shelter where the rock paintings are estimated to be approximately 1 000 to 2 000 years old. The frieze appears to have spiritual significance, as several of the animals have human hind legs or human faces, conveying the merging of worlds as the healer enters into trance and the spiritual world to bring healing and request rain and abundant game for his people. It’s best to avoid the midday heat. Put on your walking shoes, don a sun hat, carry sufficient water and be prepared to be awed. Hosting is at Hetzner Germany. Unfortunately there is no affiliate program at Hetzner. Thanks for asking though and thank you for your positive feedback!